Turning a classic cookie of the past into a contemporary cocktail of today. Oatmeal cookies always think of my Mom because we used to make them together when I was a kid. Of course Mom always had to make 2 separate batches - one with raisins and one without - otherwise she would watch us kids pick raisins out of every cookie, lol. (We took them out of cinnamon rolls too!) Oatmeal cookies were the only way Mom could get us to like oatmeal so we made them a lot. 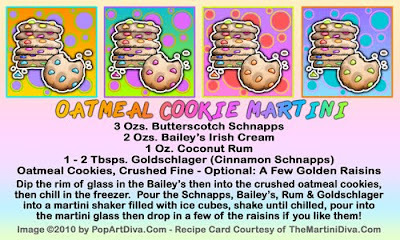 I grew into liking oatmeal and even raisins in my oatmeal cookies decades later and you'll notice I even suggest a few golden raisins as garnish for this martini. 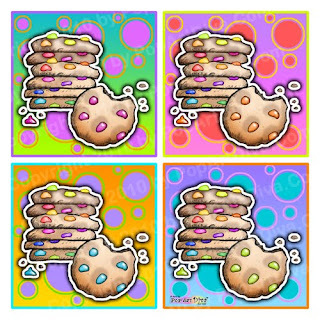 If you are still a raisin-picker-outer feel free to use chocolate chips instead, lol.